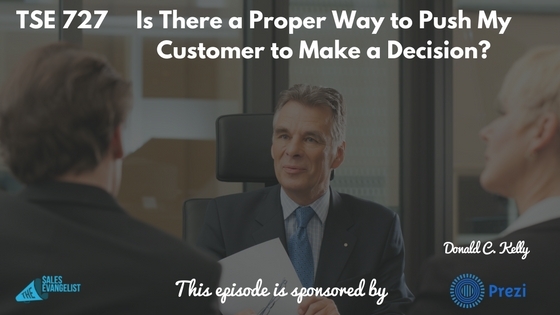 TSE 727: Is There a Proper Way to Push My Customer to Make a Decision? 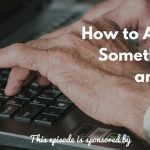 Home » TSE Podcast Post Page » TSE 727: Is There a Proper Way to Push My Customer to Make a Decision? 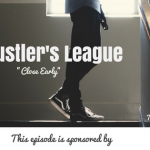 How can you push your product without being too pushy? Of course, we all want close deals. Who doesn’t? But the last thing you want is to come off a too push with your clients. So how do actually make the sale without tarnishing the relationship with your clients? Today, I’m sharing some thoughts and insights you can apply to your own conversations. Sometimes, clients can be dragging their feet to buy something. And we allow customers to make the wrong decision because we’re afraid of “pushing” them. So you have the choice to push all the way to one side of the pendulum where you’re totally lenient. Or you can be on the other side being all too pushy, just like The Wolf of Wall Street. Encourage your customers to make these decisions in their best interest. Create value. As a seller, help the buyer see the vision and the value in it. Don’t assume the prospect can see the value. But sometimes, they need that added guidance. Make sure you’re able to identify their true problem. Then make sure they understand that problem. Once they see it, it’s easier for them to see the ROI. Try to mitigate the risk for your customers. Maybe you can give them a 30-day guarantee, if possible. They won’t necessarily use those but letting them know there’s a way out is self-reassuring. Try to position this sense of urgency. You can also a time-limit proposals since giving them time restraints can also help. Also talk about the limited number. Help the client create a time frame with you. Walk them through the time frame. Once they’re able to walk through the timeline with you, it makes it easier for them to recognize the urgency or the importance of following that time schedule. So break down your time frame with them from start to finish. Have them get their inputs, too. Ask them what could hold them back from making the decision. Or present how much they’ve lost from not fixing the solution, and ask them how much more are you willing to lose? If you’ve built enough value, they won’t see you as a jerk. They won’t see you as being pushy. They’re just going to see you as somebody who cares for them. There are different ways to approach this but it all comes down to asking powerful questions and more personal ones. Do it from a consultative side as opposed to just as a seller.